We have conducted several studies using different animal models to define the effective compounds. We started with the usage of protective effect of endogenous compounds like dopamine and serotonin and designed, synthetized & tested 150 structurally-related compounds for protective effects. The 15 most potent compounds were selected and tested on in vitro ADME properties. We have identified 4-5 proprietary compounds for further development (PCT/NL2013/050915). Sulfateq is now the owner of new proprietary chemicals with a broad applicability in therapeutics and cell / tissue engineering. Contact us for further information on the different performed studies. Diabetic nephropathy is still a common complication of type 2 diabetes mellitus (T2DM) and improvement of endothelial dysfunction (ED) and inhibition of reactive oxygen species (ROS) are considered important targets for new therapies. Recently, we developed a new class of compounds (Sul compounds) which inhibit mitochondrial ROS production. Here, we tested the therapeutic effects of Sul-121 on ED and kidney damage in experimental T2DM. Diabetic db/db and lean mice were implanted with osmotic pumps delivering Sul-121 (2.2 mg/kg/day) or vehicle from age 10 to 18 weeks. Albuminuria, blood pressure, endothelial mediated relaxation, renal histology, plasma creatinine, and H2O2 levels were assessed. Sul-121 prevented progression of albuminuria and attenuated kidney damage in db/db, as evidenced by lower glomerular fibronectin expression (~50%), decreased focal glomerular sclerosis score (~40%) and normalization of glomerular size and kidney weight. Further, Sul-121 restored endothelium mediated vasorelaxation through increased production of Nitric Oxide production and normalized plasma H2O2 levels. Sul-121 treatment in lean mice demonstrated no observable major side-effects, indicating that Sul-121 is well tolerated. Our data show that Sul-121 inhibits progression of diabetic kidney damage via a mechanism that involves restoration of endothelial function and attenuation of oxidative stress. Encouraging advances in cell therapy research with adipose derived stem cells (ASC) require an effective short-term preservation method that provides time for quality control and transport of cells from their manufacturing facility to their clinical destination. Hypothermic storage of cells in their specific growth media offers an alternative and simple preservation method to liquid nitrogen cryopreservation or commercial preservation fluids for short-term storage and transport. However, accumulation of cell damage during hypothermia may result in cell injury and death upon rewarming through the production of excess reactive oxygen species (ROS). 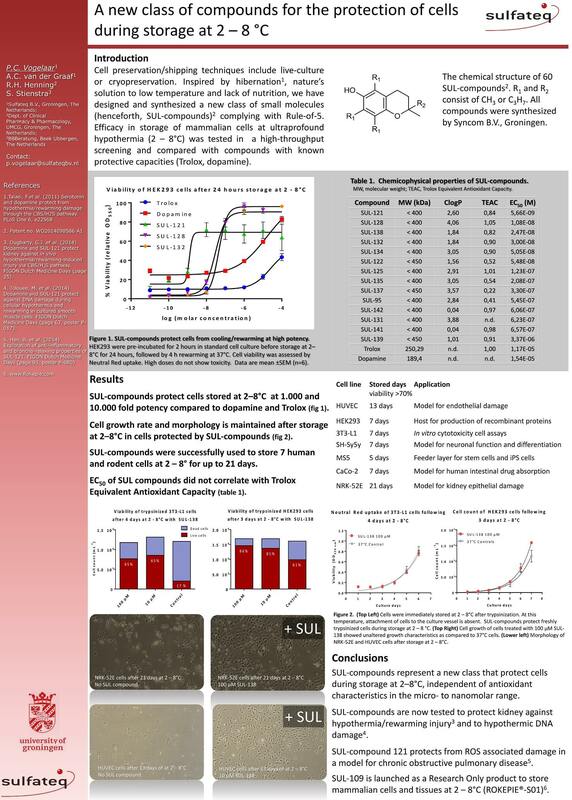 Here, the ability of the cell culture medium additive SUL-109, a modified 6-chromanol, to protect ASC from hypothermia and rewarming damage is examined. 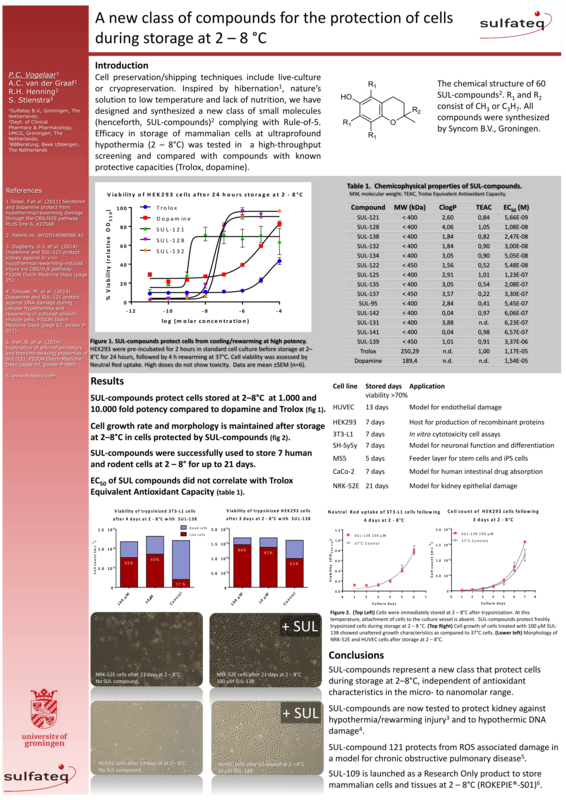 SUL-109 conveys protective effects against cold-induced damage in ASC as is observed by preservation of cell viability, adhesion properties and growth potential. SUL-109 does not reduce the multilineage differentiation capacity of ASC. SUL-109 conveys its protection against hypothermic damage by the preservation of the mitochondrial membrane potential through the activation of mitochondrial membrane complexes I and IV, and increases maximal oxygen consumption in FCCP uncoupled mitochondria. Consequently, SUL-109 alleviates mitochondrial ROS production and preserves ATP production. In summary, here we describe the generation of a single molecule cell preservation agent that protects ASC from hypothermic damage associated with short-term cell preservation that does not affect the differentiation capacity of ASC. COPD is characterized by persistent airflow limitation, neutrophilia and oxidative stress from endogenous and exogenous insults. Current COPD therapy involving anticholinergics, β2-adrenoceptor agonists and/or corticosteroids, do not specifically target oxidative stress, nor do they reducechronic pulmonary inflammation and disease progression in all patients. Here, we explore the effects of Sul-121, a novel compound with anti-oxidative capacity, on hyperresponsiveness (AHR) and inflammation in experimental models of COPD. Using a guinea pig model of lipopolysaccharide (LPS)-induced neutrophilia, we demonstrated that Sul-121 inhalation dose-dependently prevented LPS-induced airwayneutrophilia (up to ~60%) and AHR (up to ~90%). Non-cartilaginous airways neutrophilia was inversely correlated with blood H2S, and LPS-induced attenuation of blood H2S (~60%) was prevented by Sul-121. Concomitantly, Sul-121 prevented LPS-induced production of the oxidative stress marker, malondialdehyde by ~80%. In immortalized human airway smooth muscle (ASM) cells, Sul-121 dose-dependently prevented cigarette smoke extract-induced IL-8 release parallel with inhibition of nuclear translocation of the NF-κB subunit, p65 (each ~90%). Sul-121 also diminished cellular reactive oxygen species production in ASM cells, and inhibited nuclear translocation of the anti-oxidative response regulator, Nrf2. Our data show that Sul-121 effectively inhibits airway inflammation and AHR in experimental COPD models, prospectively through inhibition of oxidative stress. Hibernation is an energy-conserving behavior in winter characterized by two phases: torpor and arousal. During torpor, markedly reduced metabolic activity results in inactivity and decreased body temperature. Arousal periods intersperse the torpor bouts and feature increased metabolism and euthermic body temperature. Alterations in physiological parameters, such as suppression of hemostasis, are thought to allow hibernators to survive periods of torpor and arousal without organ injury. While the state of torpor is potentially procoagulant, due to low blood flow, increased viscosity, immobility, hypoxia, and low body temperature, organ injury due to thromboembolism is absent. To investigate platelet dynamics during hibernation, we measured platelet count and function during and after natural torpor, pharmacologically induced torpor and forced hypothermia. Splenectomies were performed to unravel potential storage sites of platelets during torpor. Here we show that decreasing body temperature drives thrombocytopenia during torpor in hamster with maintained functionality of circulating platelets. Interestingly, hamster platelets during torpor do not express P-selectin, but expression is induced by treatment with ADP. Platelet count rapidly restores during arousal and rewarming. Platelet dynamics in hibernation are not affected by splenectomy before or during torpor. Reversible thrombocytopenia was also induced by forced hypothermia in both hibernating (hamster) and non-hibernating (rat and mouse) species without changing platelet function. Pharmacological torpor induced by injection of 5′-AMP in mice did not induce thrombocytopenia, possibly because 5′-AMP inhibits platelet function. The rapidness of changes in the numbers of circulating platelets, as well as marginal changes in immature platelet fractions upon arousal, strongly suggest that storage-and-release underlies the reversible thrombocytopenia during natural torpor. Possibly, margination of platelets, dependent on intrinsic platelet functionality, governs clearance of circulating platelets during torpor.